To be honest, I was surprised at how much my grandson enjoyed it, as his reading choice when he’s at our house, at the moment anyway, mostly consists of dinosaurs, dinosaurs and more dinosaurs. Jimmy the House Spider kept his interest and was a welcome change. The fact that a spider lived in Grandpa’s top pocket caused much amusement and Jimmy’s adventures and the dangers he faced added to the enjoyment, which was enhanced by very good illustrations. “I think I’ll call you Jimmy, because of the way you shimmy across the floor,” said Grandpa, and so the name stuck. It’s a cute story with facts about other insects and animals woven into the narrative, and an underlying message which hopefully will encourage, and help children to lose their fear and/or dislike of spiders. The way it’s written educates in a fun way and shows spiders in a harmless and engaging light. 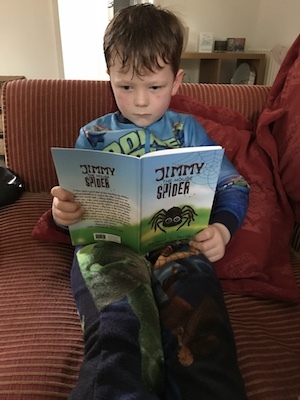 I chose to read and review Jimmy the House Spider for Rosie Amber’s book review team, based on a copy of the book from the author. Raymond Thomas Davies was brought up in the North East of England and combined a successful career as an engineering consultant with music and singing. 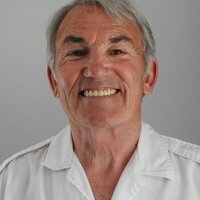 Now living in North Yorkshire with his wife Jennifer, he has five children and eight grandchildren. He now spends his time writing and composing/recording music. Sounds like a fun book with an important message. What fun getting to read with your grandson. Lovely book. I wish I had one of those when I was little. It wasn’t until I was much older I learnt not be afraid of the poor little house spiders. Plus, in some cultures, spiders are considered to bring wealth 😉 Will check this one out.